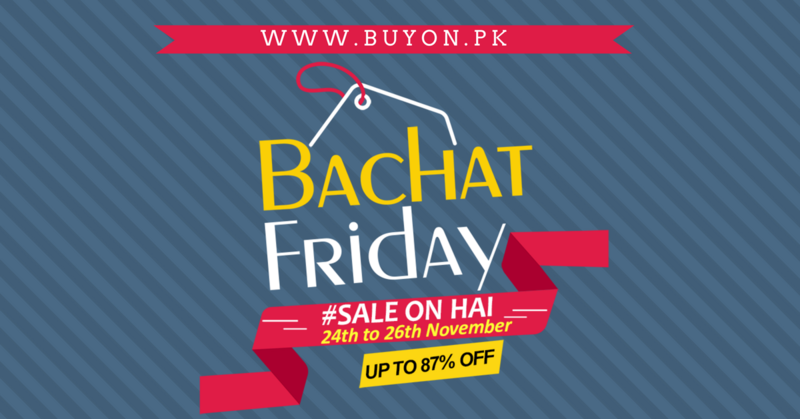 Buyon.pk invites you to celebrate Bachat Friday, with exclusive promotional deals for all the customers, nationwide. Remember the date and mark your calendars. Starting from 12 am, 24th Nov 2017 to 11:59pm, 26th November 2017, Bachat Friday will give you a memorable and promising 3 days shopping experience. This is an amazing opportunity for all the customers to take advantage of hot deals, which will not be available otherwise. We are offering up to 87% discount, for our customers to take as much benefit as they can. Our sellers are all set and they have stocked their inventories for our customers to receive their orders on time. Moreover, no compromises will be made on customer service as we understand the importance of value for money. Also, the event is not restricted to any particular city; hence all the people in Pakistan can avail this opportunity to shop their favorite products at affordable and lowest possible prices. Lastly, for the ease and convenience of our customers, cash on delivery, bank transfer and Easypaisa is available as the modes of payments. So, stay tuned and updated through our website and Facebook Page to get the best shopping experience in these 3 days.